Hmmm. I’d be very careful parking in any private lot and then hopping on the train. Metro got $109 million for two projects: a subway turnback facility in DTLA so Red/Purple Line trains can run more frequently in the future and the Airport Metro Connect project, where Crenshaw/LAX Line and Green Line riders will one day switch to the LAX people mover to reach airport terminals. Though state cap-and-trade has been criticized by its foes, including petroleum interests, it continues to be a key source of funding for critical livability projects, including these transit capital projects, plus high-speed rail, transit-oriented affordable housing, and more. Governor Jerry Brown is pushing to extend cap and trade, but it appears that that effort may need to go to a statewide initiative vote, instead of the theoretically easier state legislation route. Joe Linton is dead-on correct. The program is transferring money from polluters to good mobility projects. But whether it will continue to do so is up in the air. This is a critical issue for high-speed rail, which will likely need these funds to get built. This was primarily an economic move, reports NPR. Instead of closing between 12:30 a.m. and 1 a.m., the all-night service is intended to make London competitive with other European cities that have all night service and to help London’s economy by adding jobs at bars and clubs. We almost have all night service in L.A. on Fridays and Saturdays with trains running until 2 a.m. or so and then starting back up after 4 a.m. One challenge in London was working with the unions — the overnight shifts are not exactly coveted — and freeing up track space from maintenance programs. Sure, some of the stuff built for the Games will benefit the wealthy — i.e. the new golf course and thousands of apartments for the athletes village. But the new subway extension, bus rapid transit lines and other pedestrian upgrades will improve the commutes for many other Brazilians, so says the NYT. Something to ponder with the L.A. area in the running for the 2024 Summer Games. The other three candidate cities are Budapest, Paris and Rome. The Source handicap of the race: L.A. is the favorite, Budapest is the dark horse, Paris will be hindered by security concerns and Rome is DOA. I’m always ambivalent by the time the Olympics are done. I dumbly rely on NBC’s prime time coverage, which is quite terrible unless: you like to watch commercials and the dead time between events; believe that the Olympics concern only Americans; believe that the Olympics consist of five or six sports. In other words, I mostly stopped watching about 10 days ago. But “Stranger Things” is so excellent! Which brings us to today’s timewaster: check out this site which lets you see which nations did best medal-wise on a per capita basis. Fun fact: the U.S. got one medal for every 2.6 million people whereas Grenada, the Bahamas and Jamaica (the top three) got one medal for every 106,000, 194,000 and 247,000 people, respectively. Contrast that with India — which got one medal for every 655 million people and must clearly find the eye of the tiger before the 2020 Tokyo Games roll around. On a per capita basis, Canada did substantially better than the U.S. Must be all that lumberjacking and fresh air! 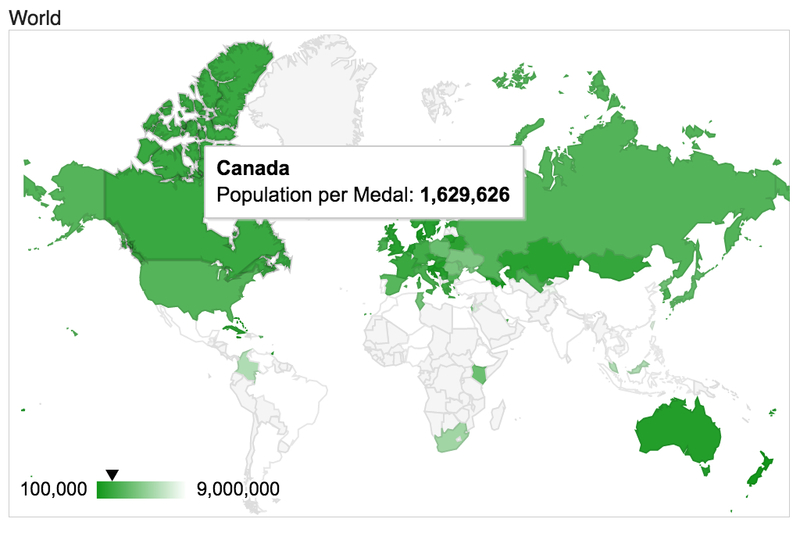 My highly-scientific arm chair theory of Canada’s higher medal haul on a per capita basis was that Canada has fewer McDonald’s on a per capita basis than the U.S. Turns out that’s only sorta true — looks like Canada has about one McD’s for every 25,000 residents versus the U.S. having one for every 22,000 residents, according to some quick interneting by yours truly. Or maybe it’s just that Canadians tend to lead a more outdoorsy and active lifestyle. The idea is to raise some revenue. No one is really sure if businesses are interested but there have been a few deals done around the country. Metro does have a policy about naming stations after people and is working on one about station naming rights. Dept. of L.A. Rams: as we’ve cautioned before, NFL preseason games are beyond meaningless — the only thing that matters is not getting the starters hurt. That said, it’s nice to see the Rams at 2-0 after toppling the Chiefs at the Expo Line-adjacent Coliseum on Saturday. Next home game is the real thing, Case Keenum: Sept. 18 versus Seattle. I think we can all agree that a Seahawks loss — any Seahawks loss — is always a welcome development. Yes, a really questionable one. Metro stepped over the line when it removes all street name references. I grit my teeth every time I get off the bus near the Expo ‘LATTC/Ortho’ station which is between 23rd and Adams on Flower. Grrrrr. Looking at the 2016 Los Angeles Rams schedule, may I request further rounds of transit haiku battles with the agencies that operate in the cities of the teams the Rams will be playing? Not that the average reader here would do this, but don’t park in a shopping mall parking lot instead of the Culver City Metro lot – or La Cienega, if it’s full. Paying $2 is preferable to the risk of getting a ticket or being towed. Yeah. you do not want to have to explain to the police why your car is seemingly stolen. Most businesses know the cars of their employees and anyone parked for more than an appropriate time to conduct business, or before or after hours, is going to be suspect.